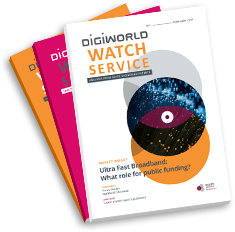 DigiWorld Watch : A monthly watch service to keep up with the latest digital innovations, markets trends and corporate news, and the emerging weak signal from the digital noise. Receive a chronicle of the latest digital industry news (mergers and acquisitions, key alliances, regulation…) and a spotlight analysis of a headline topic, every month on your computer, tablet or smartphone. Satellite : Will next generation LEO be a game-changer? More than 100 multinationals trust the expertise of IDATE DigiWorld. Access to the DigiWorld Institute is granted by substitution or membership.